Seyfarth Synopsis: In the high-profile EEOC race discrimination litigation against Bass Pro, the Court denied the EEOC’s motion for a ruling that would have allowed it to include in its § 706 claims those individuals who had not yet applied to work for Bass Pro when the mandatory Title VII conciliation process took place. Seyfarth Synopsis: Following a major victory for an airline-industry employer over the EEOC in a Title VII action regarding religious accommodations, the Court denied the EEOC’s motion for a new trial. The decision is a blueprint for employers on turning the tables on the Commission’s litigation tactics. 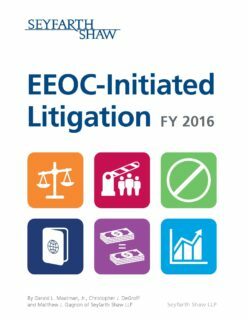 Seyfarth Synopsis: On October 17, 2016, the EEOC unveiled its updated Strategic Enforcement Plan (“SEP”) for Fiscal Years 2017-2021. It ought to be required reading for every employer and their executive teams.